From music and TV to gaming and social media, some amazing nominees competed for every category at this year's Teen Awards. 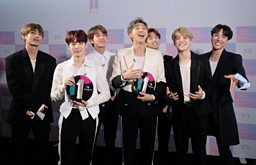 Here's the full list of 2018 winners, including two prizes for BTS. The moment Para-athlete Kare Adenegan accepted her BBC Sport Young Sports Personality award. Kaz, Dani, Megan and Wes from Love Island pick up their 2018 Teen Award for Best TV Show.